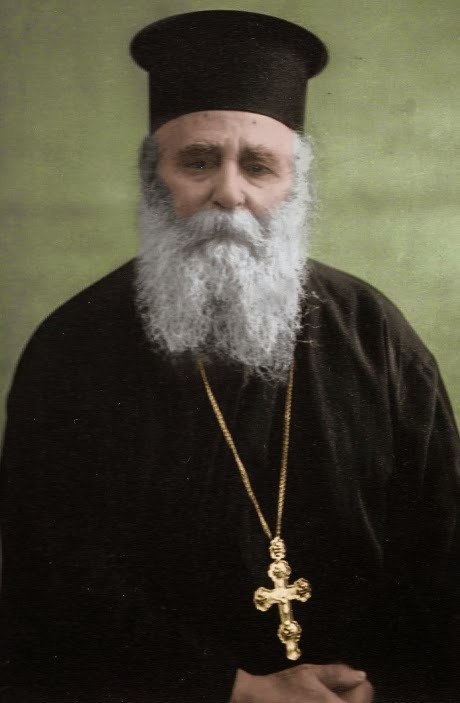 Orthodox Priest Gervasios Paraskevopoulos died in 1964. His skull was exhumed on 29th of June, 2014, washed, kissed and worshiped. The Greek Orthodox Church writes about priest Paraskevopoulos from Patras in Greece, a man born in 1877. The skull has been cleansed, and are getting ready for worship. As a parish priest now Father Gervasios “was placed under the light, so that he could shine to everyone in the house.” He knew all his parishioners personally. He turned with zeal mainly towards the youth. Catechetics, sermons, confessions, Divine Liturgy four times a week—the zealous parish priest did everything. 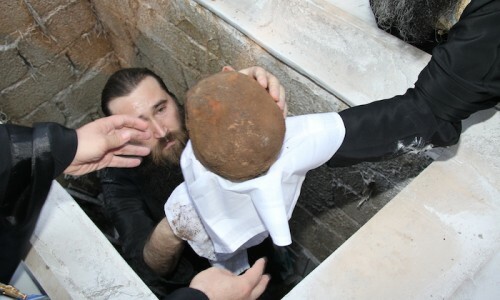 on 29th of June, 2014, the skull of the priest was exhumed. 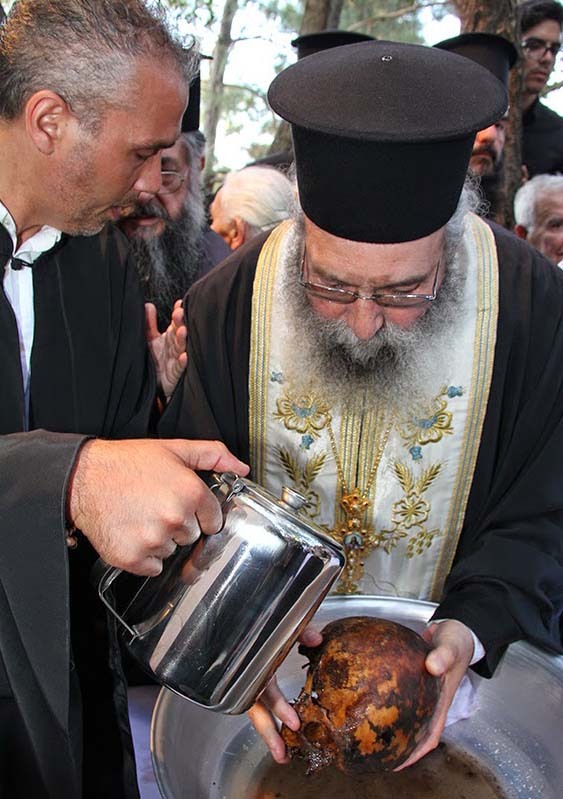 The skull was washed and worshiped, and the parishioners celebrated. This is written on an orthodox website. 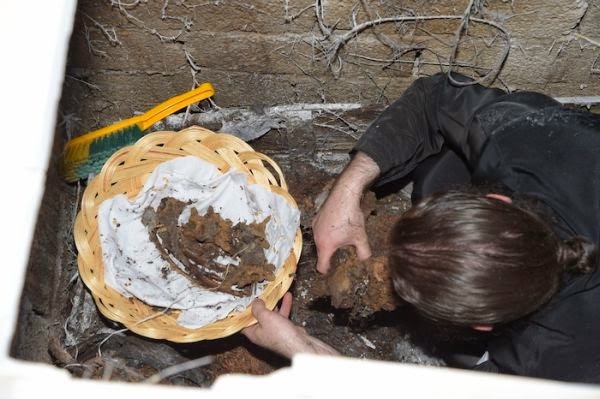 The gacve looters take pictures, and they have dug deep for the skull. 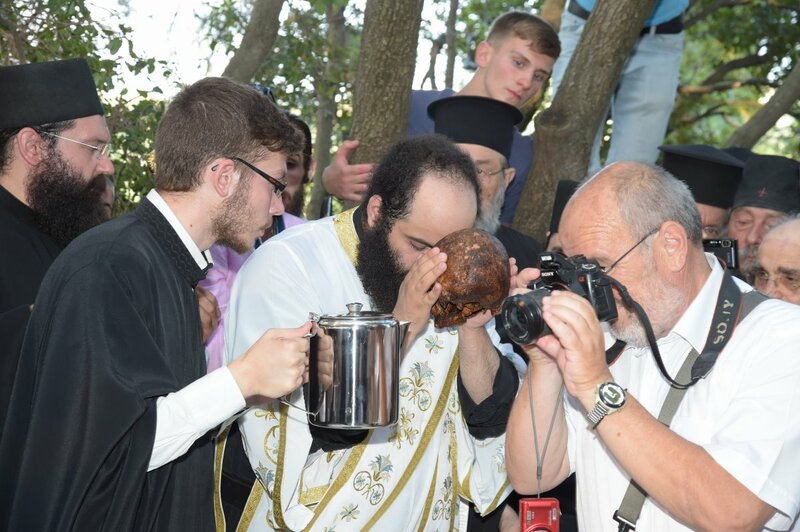 One of the priests surface with his trophy. The dirth is removed and the skull is calfully washed. This is how this prist looked before he was burried, and his head leter cut off inside his grave. The cut of skull is worshiped. Even the can with water draws the interest of local photographers. In this generation, the Pope is surely challenged by freelance looters of graves. No longer do the Papacy in Rome have the exclusive powers to beautify and declare “saints”. 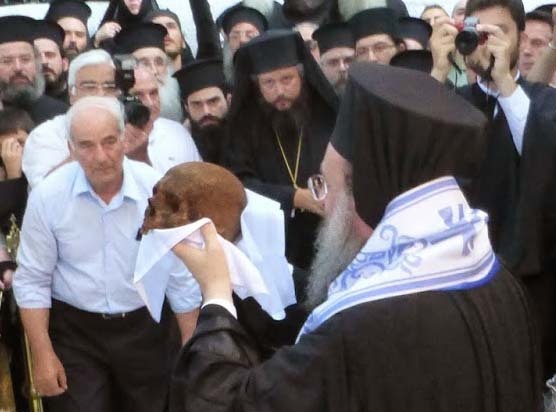 Just look at these skull looters for “Christ” in Patras in Greece. This priest was not permitted to rest in peace. His fellow clergy opened his grave, and presumably cut the head off the corpse. There seems to be no physical evidence, that the priest was beheaded before or under his funeral in 1964. When religious people behave like barbarians in the name of “Christ”, the true Messiah is defamed. 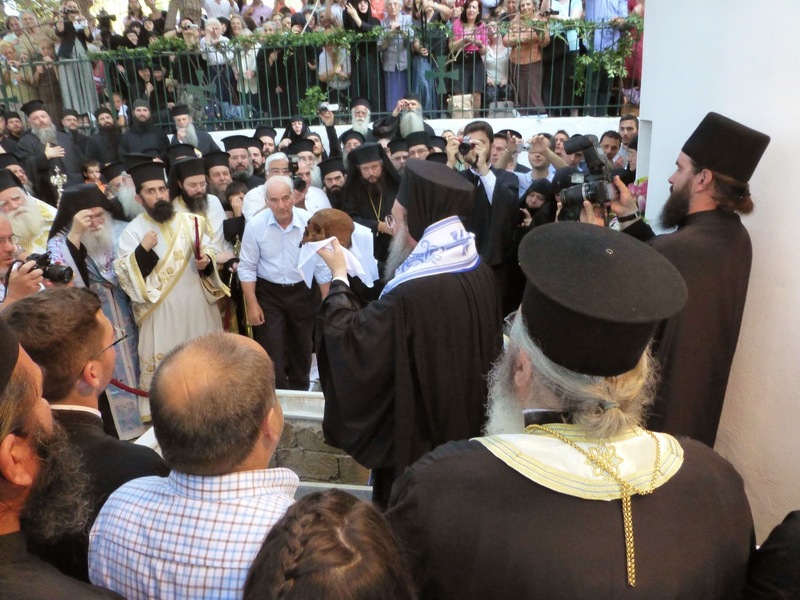 By their wickedness, these Greek men opens pop for the true Christian faith being ridiculed. All over the world, millions of people are holding their fingers over their nose, and promise to stay away from such religious insanity. When I see this kind of gathering of the wicked, I must admit that I am almost boiling over with anger. But I promise, I will let God alone, take care of their final jugdment. Do not take revenge, my dear friends, but leave room for God’s wrath, for it is written: ‘It is mine to avenge; I will repay,’ says the Lord. But truly, i proclaim. There were surely valid reasons for God of the Bible to prepare a lake of fire, for the devil and his children. You see a lot of them on these photos. If they do not repent, they will all be sent to Hell, when Jesus the Messiah returns as the Lion of Judah. Do not support this kind of evil, but rather expose it. I wish I could get my catholic mom to look at this. She said she does not follow what the pope does. She will not talk about it,saying, ” you have your religion and I have mine”. Praying the Lord will let them see all who blindly follow. My brother went to heaven 8-18-2014 59 yrs old. I praise the Lord. My brother suffered so in less than a year, he fought the good fight and strove for the victory In Christ as his Savior. Amen! One of the worst errors a Christian can make, is to bow before and accept the claimed authority of the Pope in Rome. I would rather be burned at the stake. Tell your children about the evils of the Papacy. Its a matter of life and death. May Jesus the Messiah have mercy on all decived souls. Jeremiah 8:3 And death shall be chosen rather than life by all the residue of them that remain of this evil family, which remain in all the places whither I have driven them, saith the LORD of hosts. The evilness of man has come full circle since Jeremiah’s time on earth…God will not be mocked..